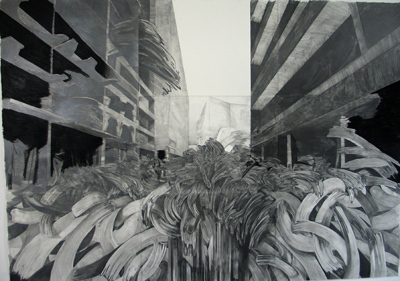 Gegen mein Gehirn_Zerstörung (Against My Mind_Destruction), 2007, pencil and charcoal on paper, 82 3/4 x 118 1/8". The dialogue between the Jewish poet Paul Celan and the German philosopher Martin Heidegger, a Nazi sympathizer, is fairly well known. It is perhaps less well known that in 1967 Heidegger invited Celan to go hiking with him in Todtnauberg in the Black Forest and that Celan had hoped this encounter would lead to Heidegger disavowing his Nazi sympathies. What was not said during that visit was reenvisioned by Celan shortly afterward in the poem “Todtnauberg.” This poem and Celan’s entry in the guest book in Heidegger’s chalet are Marc Bauer’s points of departure for his exhibition “Gegen mein Gehirn” (Against My Mind), a collection of new drawings that forms a kind of imaginary accompaniment to the meeting. Many of the drawings, rendered in pencil and/or charcoal, are schematic; outlines and surfaces are smudged, rubbed out, or emphasized in deep black. In this way, they are analogous to the unrecorded historical event they attempt to depict, which must necessarily be filtered through a subjective lens. The works in the first room—including the large-format drawing Gegen mein Gehirn_Zerstörung (Against My Mind_Destruction; all works 2007), which depicts violent, chaotic waves erupting from the ground—are metaphors for devastation and suffering. The four-drawing series titled “Tote Köpfe” (Dead Heads), of the terrible faces of corpses frozen in shrieks of pain, bring to mind images of concentration-camp victims. The second room is dedicated to a fictitious illustration (made up of thirty drawings) of the encounter between Heideggar and Celan. Portraits of the two intellectuals alternate with eerie images of mountain and forest landscapes and concentration camps and with quotations. Opposite these drawings are boxes containing a further eighteen text fragments from various sources that visitors can take with them. The six drawings in the final room examine Celan’s suicide in 1970. Bauer’s dark, emotive visual language is appropriate for such a quasi-archaeological investigation of the unsaid and of the gaps in history.